Breakfast isn't for everyone but that doesn't mean you can't make a savory waffle. This shop has been compensated by Collective Bias, Inc. and its advertiser. All opinions are mine alone. 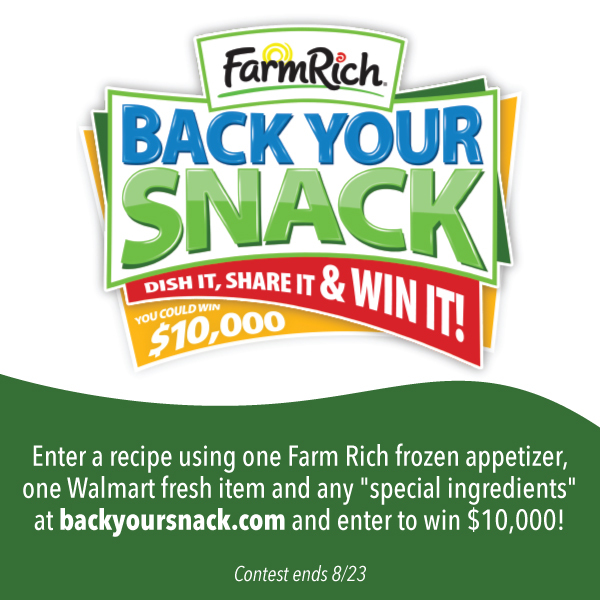 #BackYourSnack #CollectiveBias Be sure to check out how you can enter to win $10,000 with your own snack hack using a Farm Rich snack. Keep reading. It was rudely brought to my attention that not everyone enjoys breakfast all day like I do. I don't see any problem with having cereal for breakfast, french toast for lunch, waffles for dinner, and donuts for dessert. I just assumed everyone was with me on this one. Wrong! A apparently will only enjoy breakfast foods during the breakfast hour, and even then he is not a fan. While trying to come up with some new appetizer items for our next few hosting opportunities, I wanted something different. Something that didn't take ages to make because I would probably be picking up the dog's toys just minutes before guests arrived. Plus I wanted something unique and unexpected. Finally the idea popped in my head - waffles. Who doesn't love waffles? Well I guess there is a long list of people that don't want breakfast items served in the early afternoon. While shopping at Walmart, a savory waffle idea came to me. 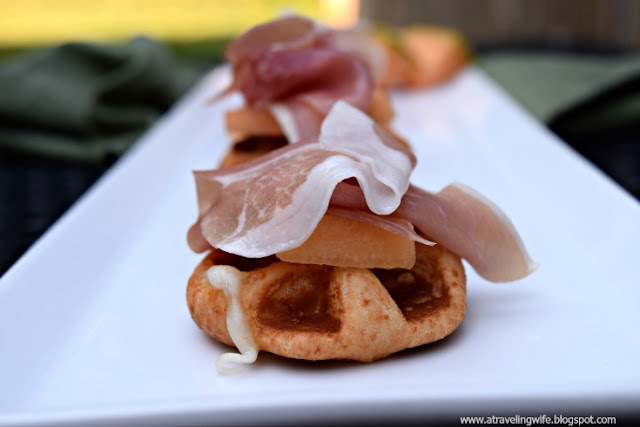 Now today I present you to the easiest three ingredient snack that is sure to please everyone - Mozzarella Waffle Bites with Melon and Prosciutto. Are you still with me? 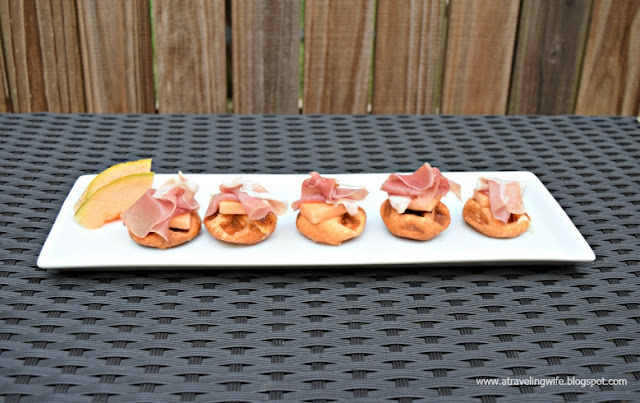 These little two-bite snacks are too easy to make. You don't have to sweat in the kitchen for hours to present a snack that is photo and drool worthy. Follow along for the ingredients and recipe. Click to tweet: This drool worthy snack takes just minutes to make. You will only need three ingredients; Farm Rich Mozzarella Bites (found in the frozen section at Walmart), one package of prosciutto, and one melon of your choice (I chose cantaloupe). First, you will need to preheat your oven to 400 degrees F and preheat your waffle iron to medium-high heat. 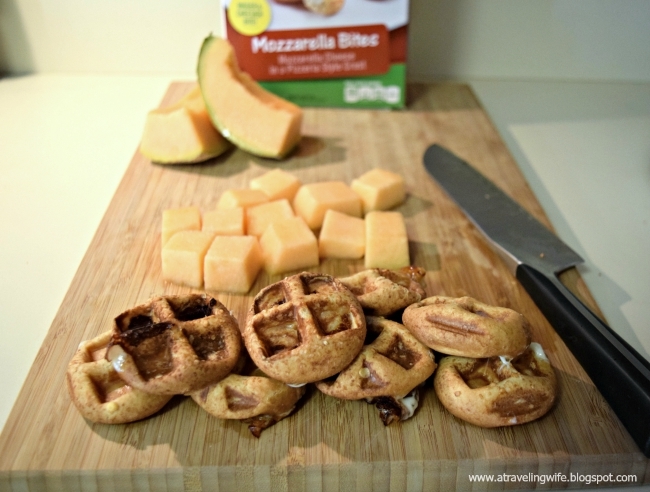 Any waffle iron will do the trick for these snacks. Now you can cut the melon into small slices after you have spooned the seeds out. 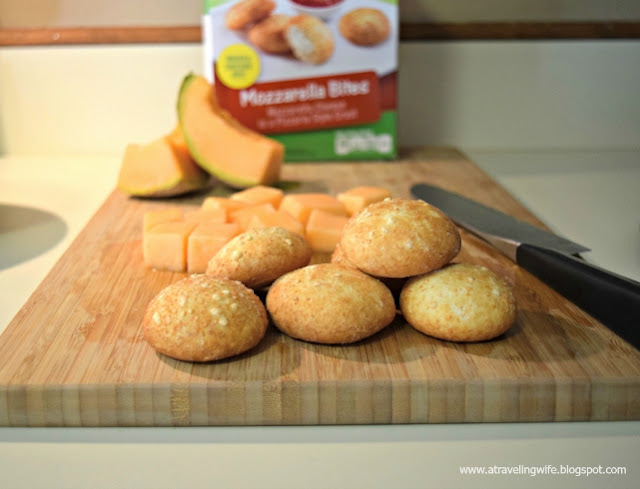 Place the Farm Rich mozzarella bites on a baking sheet and bake for 9 minutes. After the 9 minutes, place the bites directly in the waffle iron to create your mozzarella waffles. This will only take a minute and the cheese will be oozing out of the breading. Oh, the gooeyness. 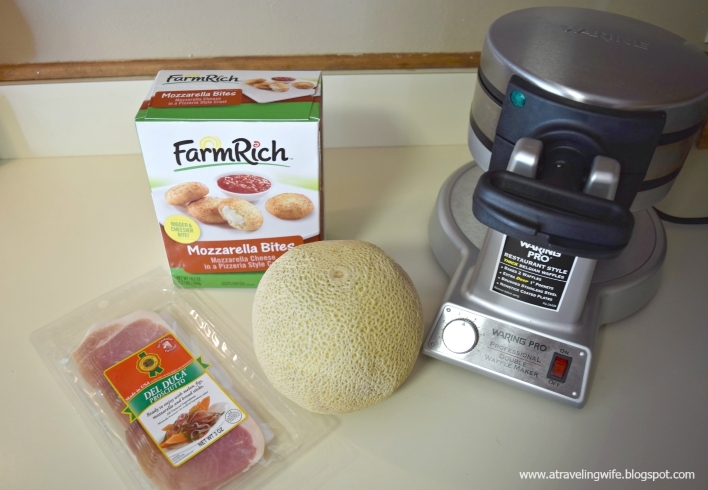 Stack these babies up however you choose - either melon then prosciutto or prosciutto then melon. You can now enjoy the fruits of your labor. 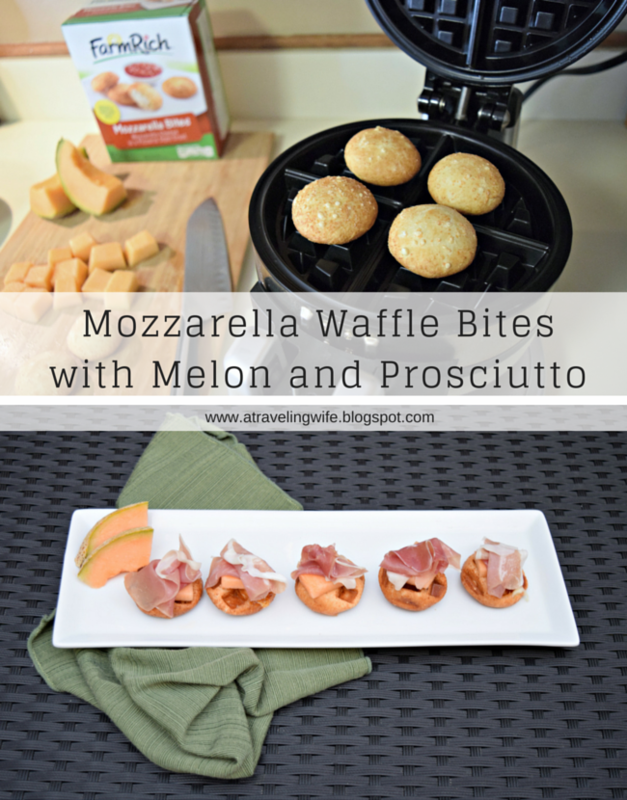 The mozzarella waffle bites with melon and prosciutto are best while hot and gooey. While you are wiping the drool from your face, did you know that you too could create a fun and unique recipe with Farm Rich products and be in the running for $10,000?! Check out the Farm Rich Back Your Snack contest submission page and be sure to check out the full rule book. Go see the freezer section at Walmart for your Farm Rich snacks. Then after the snack hack contest ends, you can go to a demo showcasing the semi-finalists. Here is a list of locations that are participating in the demo. Do you like to eat breakfast foods all day long? What's your favorite snack hack? Woah. These look super delish. Mozzarella waffles?? I'm all over that!